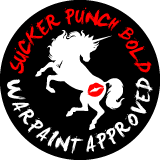 WARPAINT and Unicorns: PAPERSELF loves The Hunger Games! MAKEUP.... and lingering side effects. 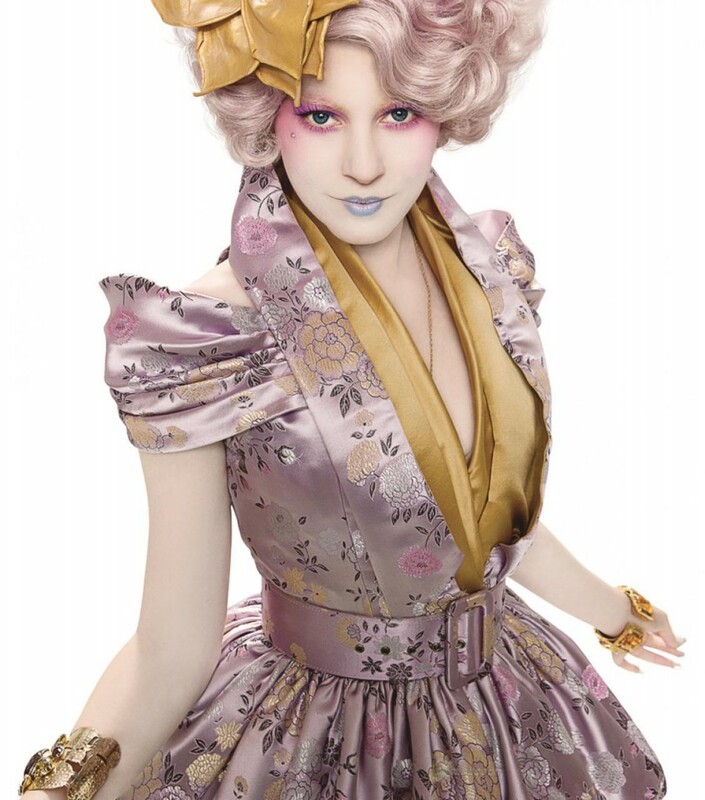 PAPERSELF loves The Hunger Games! MAKEUP.... and lingering side effects. 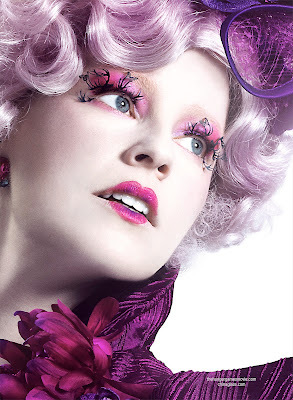 This post I'm breaking down most what was used on Effie Trinket for lashes and Katniss. I finished the book just before going to see the hunger games last night. Glad I did as I might not have enjoyed it or fallowed. I was highly distracted by the building nausea I have not experienced since I was a kid with the never stopping jerkiness of the camera. I appreciate what they were trying to do with the disorienting camera but this is not the The Blair Witch Project and there was no need to have it moving ALL THE TIME. 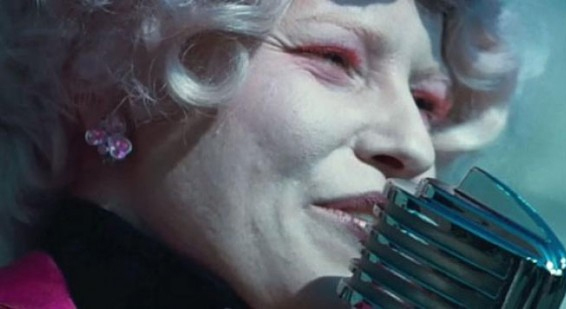 Scenes that would have befitted from the shaky camera for effect was the Repeating, Katniss tributes interview, and the bloody start gate. Honestly our brains don't see subtle movement the way a camera records it, and have it constantly shaking belittles what Katniss is feeling during certain scenes rather then highlights it. By the end of the movie I felt so much utter relef I get the heck out of there!!! I'm praying the other movies won't be completely shot in the same fashion otherswise I might need to DRUG myself ontop of the price of admission. End of Nausea Games rant and onto the makeup! PAPERSELF Deer & Butterfly lashes were used in this look with only the inner horn group horn trimmed leavinf the centre and dear and the smaller section of the inner horns replace on the lower lash line (the section with the butterfly was left out). 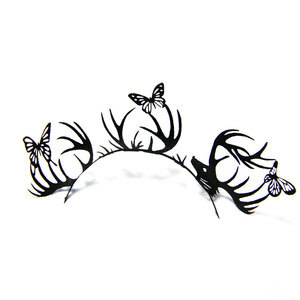 The Deer & Butterfly lashes happens to be may favorite set from PAPERSEL. Currently Sephora sell them at $9 untill they sell out. I should grab a few more pairs as I've used one that got crushed and have another one in the box. Lip were a Megenta and purple ombre. Couldn't see her nails. 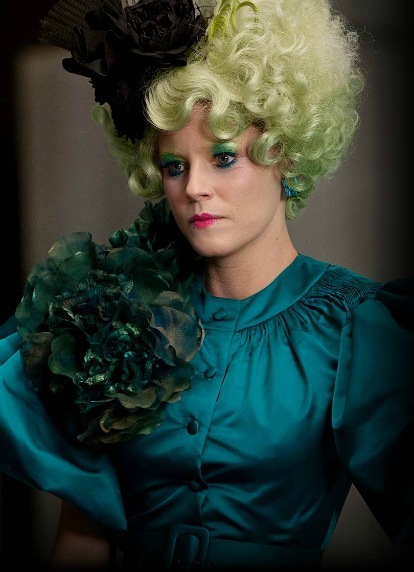 I have to start off by saying that white foundation look absolutly horrendous on Elizabeth Banks. I get the felling this was intentional as it aged her considerable, making this bright butterfly of a character look grim. The lashes used were a pair of pink one that look more coral with the lighting, making her eye line look like a bad bleach job look. I'm not sure what brand they were but they were full and wispy. The lips and nails were a hot pink and gold ombre. The lashes are outer flared and a solid violet makeing them blend into the shadow shades used a bit. 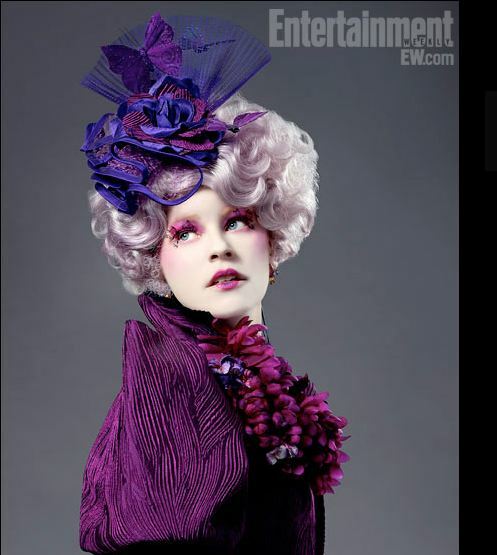 In the movie the heart is were a solid periwinkle but I prefer the white/periwinkle ombre of the promotional image. Nails again no close ups but they were subdued, probably a match lavander shades in the dress or the lips. 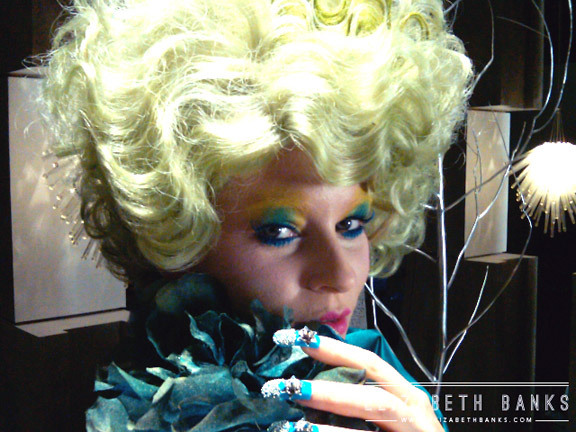 Effie Trinket during tributes scoring. Solid outer flare blake lashes a find contract to the peacock eyeshadow look. Solid hot magenta lips. Fake extra long nails are blinged out with rinestone flowers, silver pearl tip and matching teal shade to the fabric. 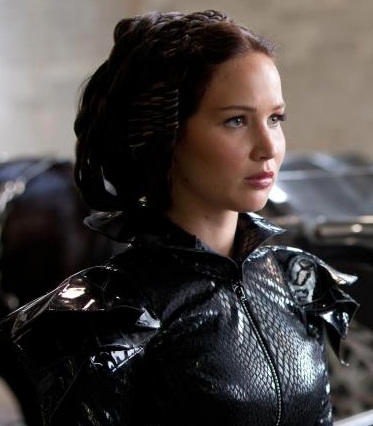 Katniss makeup in the yellow sweatheart heart dress was also simple. 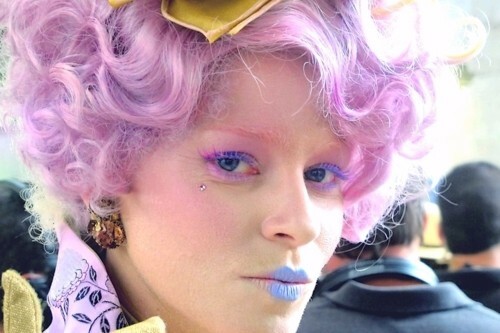 The blue winged liner shade matched the blue seen in Peeta's outfit. 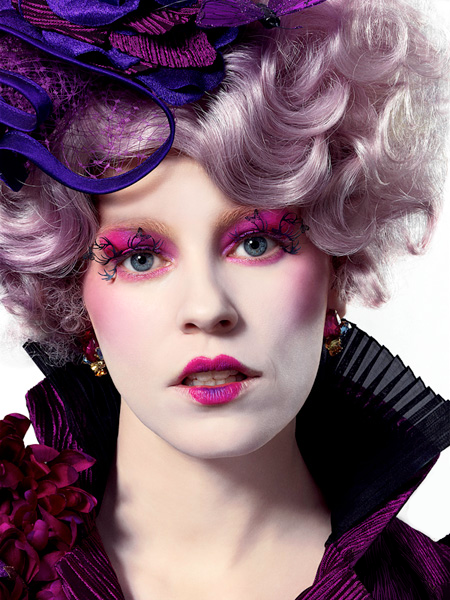 One single PAPERSELF Small Peacock lash was use on her right eye cover. You can find the set on PAPERSELF online store but you can also cut the same shape from the full Peacock set that is sold at sephora. PAPERSELF Peacock lashes are my second favorite they make but I'm not sure when I would use the whole strip myself. I love this dragon skin outfit so much. Lashes use were a thick lush and outer flared spiked black to match the shoulder pads. Again a very sophisticated pin-up look but they further down played her lips to let the dress shine. Simple full lashes were used. And a final shout out to Seneca Crane the Head Gamemaker for the 74th Hunger Games! 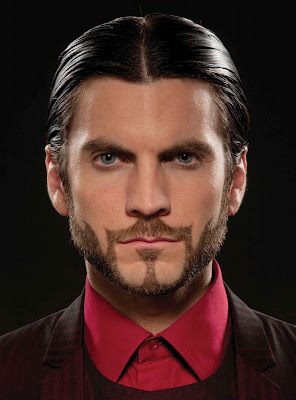 The almost flame themed shaving art on Wes Bentley amazing mug and red and black themed wardrobe is a nice touch to see in his character, and shines an almost sporting light to Katniss's trial. He took a gamble on her and was unfortunately "burn" in the end. My favorite look from the Hunger Games. It's a shame this outfit wasn't on screen longer. Despite the gaudy capital nature, this is a wonderfully sophisticated look and allow the texture of the fabric to shine on a tailor form. I love movies that push the theatrical in design but still manage for consistency in style. This is in no way a movie review as like most fan there was a few things things I would have liked to see included.